When my baby was about 15-months-old, we visited the house of a friend who had a toddler slide… Oh. My. Word. We could not get her off that slide! For the entire hour we were there, she insisted on climbing up the ladder and riding down the slide over and over again, giggling and squealing as she did. It was adorable. That was the moment I decided it was time to start doing research on the perfect toddler slide for our family. I wanted to see her having that much fun every day! There’s a lot to consider when it comes to choosing a toddler slide. How big should it be? How tall? Indoor or outdoor? Because we have long, cold winters, I knew I wanted an indoor slide. And since we have a small space, I also wanted something small. That being said, it needed to be something big enough for her to use for a few years… after all, a piece of playground equipment can be a bit of an investment. I was also looking for something gender-neutral that we could use if we ended up having both boys and girls. It was also important that the slide be of good quality materials and would be safe for my children. Let’s be honest: Although I was buying the slide for my first daughter, I anticipated having more kids and hoped the slide would be durable and last for years of play. Luckily there are lots of options to choose from! Here are the 10 slides I considered as I shopped for a toddler slide. Hopefully it will help you choose a slide that will best suit your family. 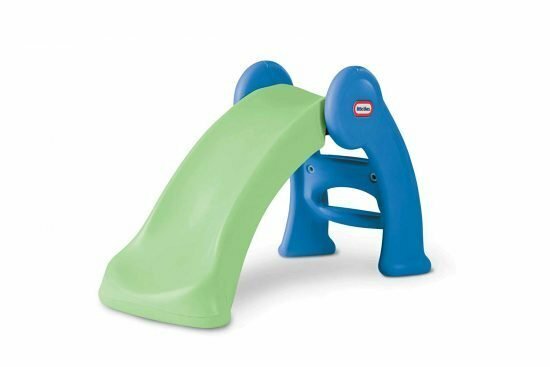 What makes the “junior” play slide different from the regular “first slide?” In addition to being slightly smaller, this slide is made of a much sturdier material. Although the slide says it will work for children up to 4 years old (50 lbs), smaller kids may have more fun on it because of its height. The slide does lack handlebars at the top for small toddlers to hold onto, but that’s not a problem for most kids. This slide folds up for easy storage, which is a plus if you live in a small space. It’s lightweight and easy to move around, so you can move it from room to room and even outside if you like. 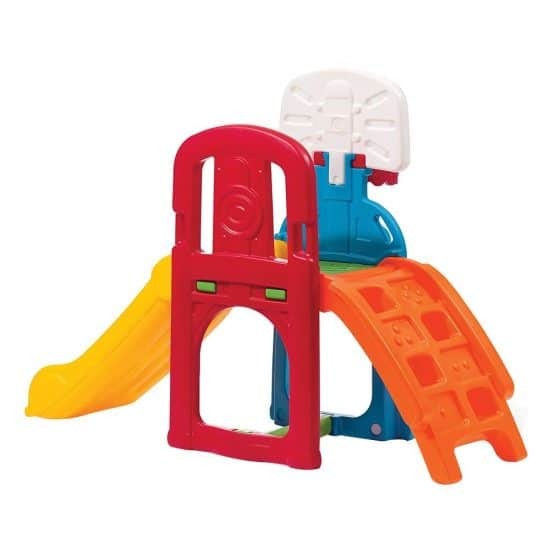 Although it is a little more expensive than the Little Tikes First Slide, this slide is worth considering because it’s made of a much more durable material. Overall, this is an excellent choice for an indoor slide for toddlers. 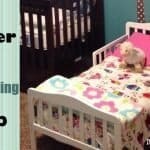 What is immediately appealing about the Step 2 Play & Fold Jr. Kids Slide is that it is simple. It’s a small, lightweight slide that’s easy to move around and store. It’s got neutral colors that don’t stand out as much as some slides, and its main function is as a slide rather than a small playground. It’s less than $50, which is also appealing. One downside of this slide, however, is that it’s not ideal for very young toddlers. Kids under the age of 2 may need some assistance climbing the stairs, sitting on the slide, and even going down. This is because there’s no handle at the top of the stairs for a 1-year-old to grip, and the stairs are thick. Although it’s a slide I couldn’t envision my baby using repeatedly, I think it’s one she would quickly grow into, and it’s hard to beat the fact that it’s lightweight and stores easily. This is a good choice for kids 2 years old or older. Perhaps even simpler than the Step 2 Play & Fold Slide is the Little Tikes First Slide. It weighs only 9 pounds, folds for storage, and costs less than $40. That being said, just looking at it you would assume it is made from more flimsy plastic. That’s okay, though, because the slide rides more easily and is still durable despite the way it looks. There have been some concerns about the slide’s safety, but you just have to be sure to assemble the slide correctly before you let your kids play on it. Particularly make sure the handles snap into the slide correctly. It is made of sturdy, high-quality material you expect from Little Tykes. 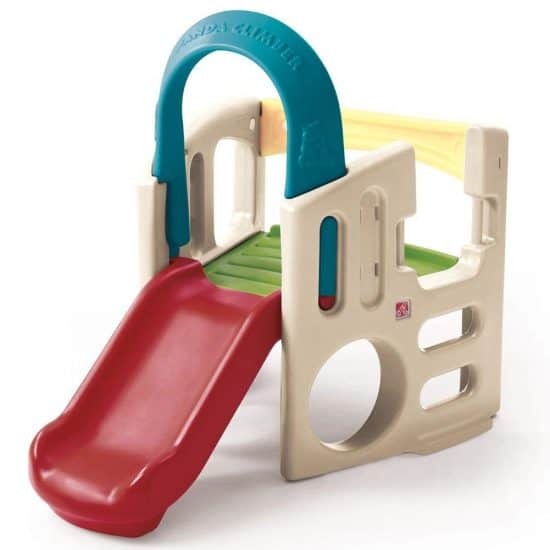 Although this slide has a smaller age range than the Step 2 Play & Fold Slide, this slide would actually work for a wider range of kids because it’s more accessible for younger kids. This little sports climber is fun because it’s more than just a slide; it also has a climbing gym and a cute little basketball hoop! It’s ideal because multiple toddlers could play with it at once, so it would be fun for twins or kids who have friends over often. Unfortunately, it doesn’t fold down for storage, but it’s also not too large. Depending on your space, you could leave it accessible all the time. The biggest downside to this slide is that it’s a pain to set up. Some of these slides have holes missing for certain screws, so you have to drill your own. If that is the case, it can take a long time to piece everything together. This slide can be a bit flimsy, so you will want to weigh it down with sandbags if larger kids want to play on it. This slide may be perfect for younger toddlers, but not so great for older ones. This little slide is attached to a small climbing gym, which makes it a little more cumbersome than some of the other slides on this list. It’s about 3 feet tall and 4 feet wide and, unfortunately, doesn’t easily fold down for storage. It is ideal for outdoor use, though those with a big indoor play space may happily use it as well. It’s heavier than other smaller slides, and although that means it’s not as easy to move, the weight also has its advantages. 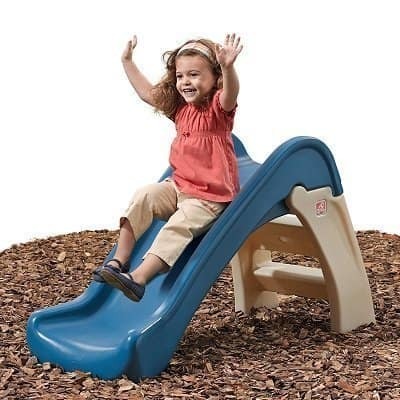 The slide is very durable and is less likely to tip over than the other slides, even when big kids get rough with it. The climbing gym also leaves a big opening underneath the slide, so kids can use it as a hideout or play place. This slide would be a good choice for both younger and older toddlers. One thing we can all agree on: The pirate theme of this slide is adorable! I love the captain’s map, the red helm, and the climbing gym that’s designed to look like a ship. Kids can spend hours pretending they’re pirates who are sailing around the world looking for buried treasure. 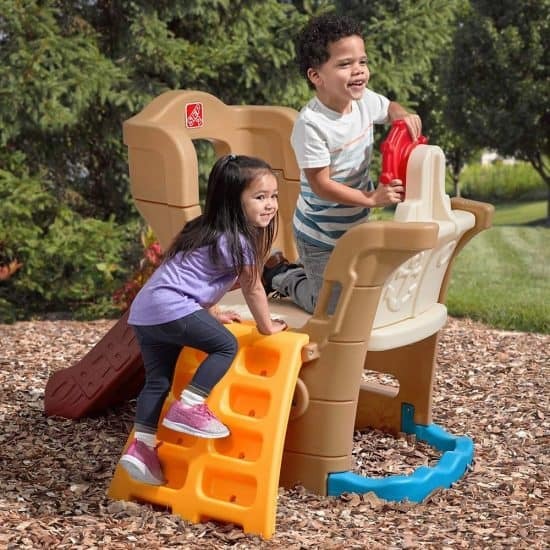 What’s awesome about this climber set is that it’s easy to assemble and sturdy so multiple kids can play on it at once. The actual slide is a little short, however, and though the playset might be fun for a 6-year-old, the slide may not. The oh-so-adorable arch is also a little small, and many people end up removing it shortly after purchasing because it makes it easier to play with. This would be a fun outdoor set that would work extremely well for toddlers ages 2-4. 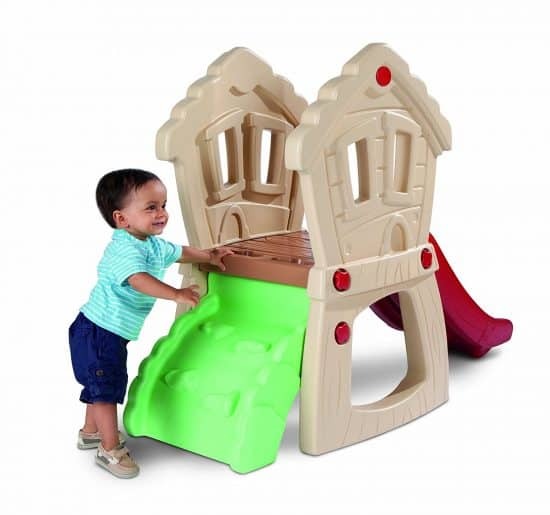 The Little Tikes Hide & Seek Climber is perfect for toddlers who love to climb. I love the large platform between the steps and the slide for a toddler to sit on before making his way down. One disadvantage, however, is that the cute platform means there’s no way to fold the playset down for storage. This slide would be ideal for younger toddlers, though the slide can be a little steep for the smallest climbers. The slide is lightweight and easy to move, but preschoolers (3-4 yrs) tend to be able to topple it, so I’d lean toward something else if you’re trying to cater to older children. The playset is also easy to assemble, which is always a plus in my book. 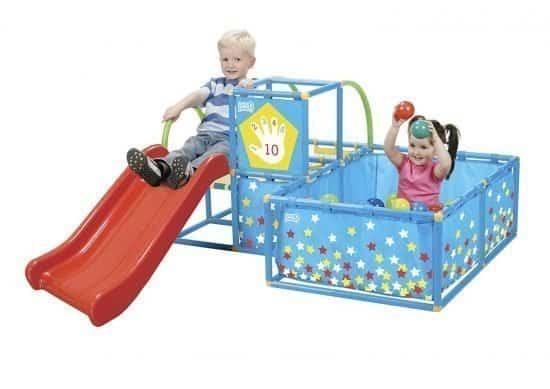 This “3-in-1” playset includes a small slide, a ball pit, and a ball-throwing target. It’s made of durable plastic tubes. As a kid, I loved ball pits, and having one in my own home would have been a blast! Amazon reviewers say this little play set generates hours of fun every single day for their little ones. My initial concern about the playset is the small age range. 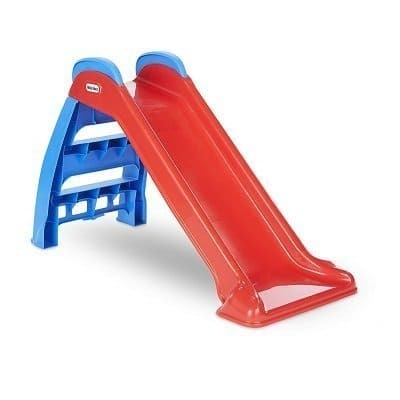 The slide is pretty short, so it most certainly won’t be fun for kids older than age 3, which is unfortunate because the playset costs nearly $150. You may also end up spending more on this playset than you anticipate because it only comes with 50 balls. That might sound like a lot, but when you put the balls in the pit, 50 balls doesn’t come close to filling it. You’ll have to go out and buy more balls if you want it to be a true ball play zone. If you’re particularly excited about the ball pit, this playset may be worth it to you, but not so if you’re more interested in a great slide. Personally, I would choose one of the other options on this list. Okay, this slide was invented by a genius. 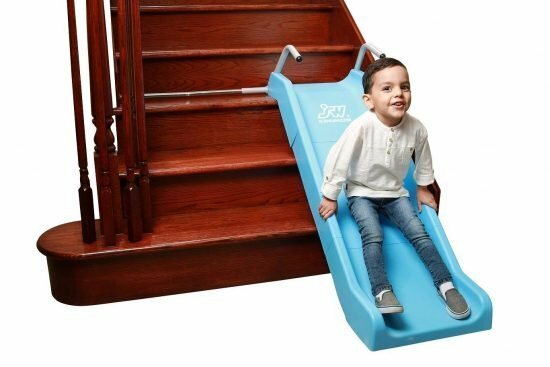 A simple slide that you attach to your stairs, takes up hardly any space, and can be used indoors by even 10-year-olds? Sounds like a dream. Unfortunately, this slide may not be the best option for those under the age of three because of its height, but older toddlers and children could get years of use out of it. Older kids might even enjoy using this slide outdoors. The company does offer a 30-day money-back guarantee, so you can try it out and return it if it doesn’t work for you. Personally, I’m excited by the space-saving factor, but a little worried that it will encourage young kids to hang out on the stairs all day. This is another gym slide that is more ideal for toddlers ages 2 and under, even though the company says it will work for 5-year-olds. It’s a very small playset. 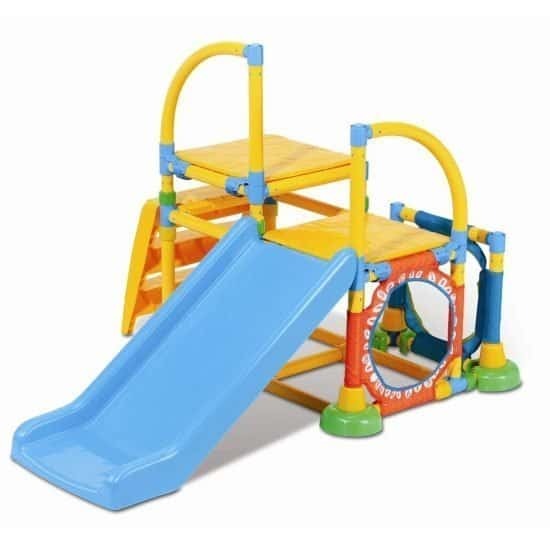 It has a 3-foot slide, a climber, a basketball and ball toss, and steps, which would no doubt be perfect for a small toddler who’s developing the gross motor skills of climbing and throwing. This set comes with five balls, which is also a plus. The overall cost of the playset is quite high, especially for its limited time of use. When I look at the playset I honestly believe it’s made of a cheap material, but supposedly it holds up well despite it being made of plastic and velcro. It’s lightweight and easy to move around, easy to set up, and great for both indoor and outdoor play. Taking kids to the park to play can be a lot of fun, but it can also be exhausting and time-consuming. With young children, regular playground equipment is often too big for them to access themselves. That means you as a parent end up lifting your child or climbing up to help your son or daughter. If you have taken a child to the playground in the hot summer heat (or if you think back to your own childhood), you have no doubt noticed the equipment can get really hot. The Consumer Product Safety Commission (CPSC) warns that children 2 and under are most likely to receive playground burns. To prevent playground burns, always check equipment before allowing children to play. Playgrounds are also a prime place for other injuries. According to the Center for Disease Control (CDC), every year in the U.S. there are 200,000 children injured on playgrounds. Most of these injuries include falls, cuts, burns, or even traumatic brain injuries. 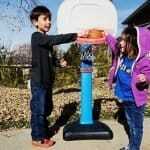 No doubt you know of kids who have suffered broken bones or other playground injuries. With an indoor slide, however, your child can enjoy the benefits of a playground in your own home. For you, that means your child is less likely to be injured. It also means less time worrying about hot equipment or having to get on the equipment with your child. It is a win-win for parents and kids, and it is definitely worth the investment. 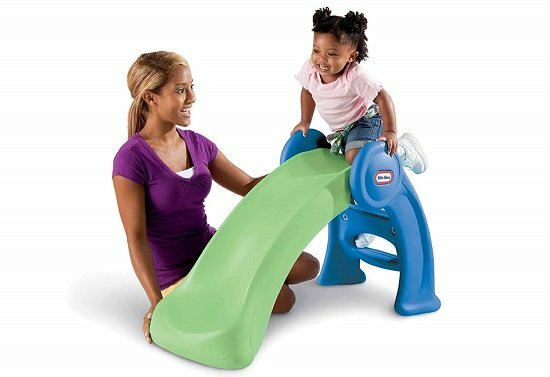 Overall, the Little Tikes Junior Play Slide is the slide I’d choose to purchase. It’s not too expensive, but it’s sturdy. 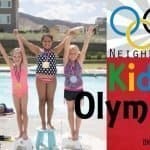 It will work fairly well for younger kids, but it’ll still grow with them as they get into the preschool age group. If I had a little more space or a bigger yard and didn’t have to worry about where to store the slide, I’d definitely pick the Step 2 Panda Climber. It looks so sturdy and fun and absolutely worth it at its price. Oh, and I still think whoever created the Stairwhizzer stair slide is inspired…. I’ll be looking into that as my kids get a little older!